Mondays are usually the day that I’m doing everything in my power to pry myself from the covers and wishing the weekend would last forever. This Monday was better, this Monday I’m a college graduate which means I’ve earned the right to sleep in, wear pj’s all day, and eat cake for breakfast. You know, adult things. While I know that this is only a temporary arrangement I wanted to take full advantage. I woke up craving something sweet but spicy — first thought was carrot cake but since I didn’t have any carrots in the house, and leaving was not an option I opted to try my hand at a gluten free version of spice cake. A bit ago I’d picked up some gluten free all purpose flour from a company called Pure Pantry. This particular brand is also soy, nut and dairy free. So off I went and this beauty came out as a result. I’ve been trying to shake up my cooking routine lately and decided to use some unrefined sugar, Mascobado, in this recipe as well. *I used The Pure Pantry brand for my GF flour but I tested it with Bob’s Red Mill and it came out well too. **You can sub in regular brown sugar for this. 1. Preheat the over to 350 degrees and line to 9-inch round cake pans with parchment paper. 2. Steep the Cardamom seeds in the milk, set aside. 3. Cream together the butter and sugar until it is light an fluffy. 4. Add the eggs, one at a time. 5. Sift together the dry ingredients and add them to the butter, egg, and sugar mixture. 6. Removed the seeds from the milk and slowly add the milk to the batter. 7. Pour the mixture evenly into the two pans and bake for 20 minutes (the cake will spring back when touched). Allow to cool completely. 1. In a stand mixer beat the butter until it is light and fluffy. 2. Scrape the sides and then add 5 cups of powdered sugar (start slow, so the sugar doesn’t coat your kitchen and work your way up to a medium speed). 3. Add the milk and almond extract. 4. The frosting should be thick, if needed add the 6th cup of powdered sugar. 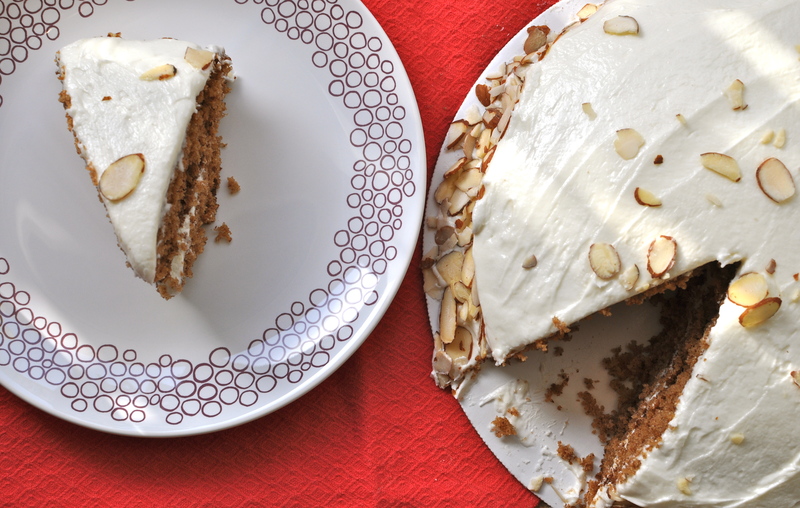 Frost the cake and garnish with sliced almonds along the sides.